Yesterday a cheery envelope from across the pond was sitting in my mailbox. I purchased this original watercolor painting by Sarah Wimperis (for $10!!) through the Ripple site set up to support 2 non-profits working to aid in the recovery and support of wildlife in the BP oil spill disaster in the Gulf of Mexico. I absolutely love it! I still can't believe all the generosity of so many artists who have offered up beautiful original works of art. I admire and respect them. I hope to add my own piece to Ripple this coming week. Here is the ripple site address: http://ripplesketches.blogspot.com/ - please visit, please purchase!! 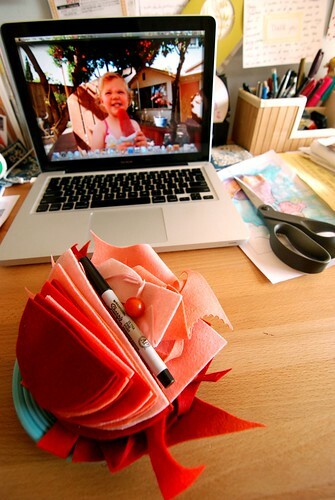 Bird's 2nd birthday party is this coming Saturday...so of course I'm making tiny felt strawberries for the table. I mean, isn't that just as important as baking a cake or cleaning up the backyard? Oh, and that teeny orange thing is our first tomato of the season! Bird already ate it. Happy I caught this yesterday morning. Bird likes to help Jared get his boots on before work. I think it's really sweet. Then they jump in the "fast" car together, back out, and wait for me to come with Jared's bag & lunch. Routines are always changing but this one has stuck for awhile. Beetle painting I made for my dad. When my dad was a kid he probably would have liked insect plushes (more than the owls or whales or penguins that I make) - beetle & butterflies fascinate him. My parents' downstairs bathroom is full of mounted insects they've collected over the years. The royal blue butterflies are the most amazing (though I feel torn about them...would rather see them outside, flying around of course). Anyway, I thought he'd like this for the space and I put my own spin on it with the vibrant flowers. Off in the mail it goes!